With the onset of winter comes the risk of ice damming and the serious damage it can cause your roof and building. Toronto winters have all the ingredients for ice dams: heavy snowfall, and fluctuating warm and cold temperatures that turn melting snow into ice. The resulting ice buildup on your roof can loosen shingles, tear off gutters and cause roof leaks, as well as make your home feel colder and increase your energy bills. To prevent this from happening every winter, you must determine what causes ice to form on your roof and find a long term solution. An ice dam is caused by the simultaneous interaction of the snow with the heat that escapes from your attic and freezing temperatures. As attic air leaks and the sun melts the snow on your roof, below zero temperatures at night cause it to freeze again into icicles and ice dams. When ice forms around the edges of your roof, it prevents the rest of the snow from sliding off, resulting in the formation of even bigger blocks of ice. The bigger and heavier the ice dams, the greater the risk of a roof collapse and water damage to your home and possessions. 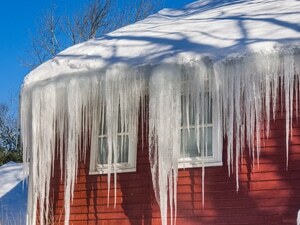 How to Prevent the Formation of Ice Dams? 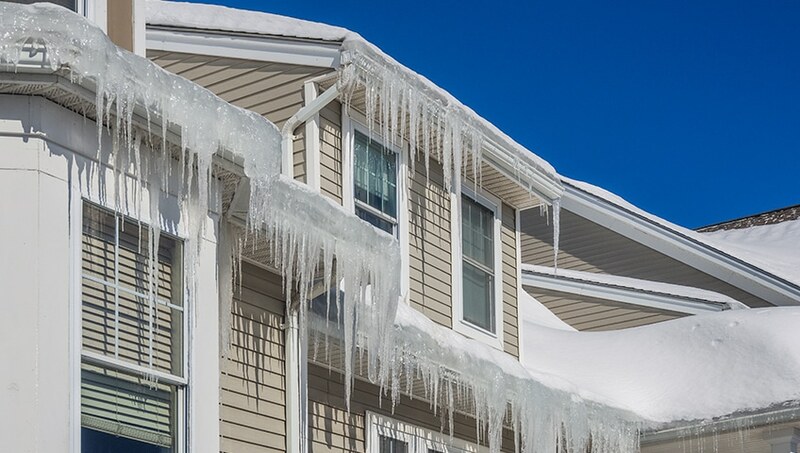 You can’t control the snow or the rise and fall in temperature, but there are certain precautions you can take to reduce the risk of ice damming and roof damage. Ensure proper attic insulation and roof ventilation: Sealing attic air leaks and improving the insulation will prevent the heat from escaping to your roof and melting the snow which leads to ice damming. It will also help keep your energy bills lower, both in winter and summer. Clean your eavestroughs and gutters in fall: A clogged roof drainage system results in water accumulation which will turn into ice as the temperatures dip below zero at night. Hire a roof snow removal service: Heavy snow fall and its continual accumulation on your roof also increases the risk of ice formation and roof collapse. Professional ice and snow removal services will clear it before any damage is done to your roof and attic. Your professional snow removal crew can also suggest appropriate measures to prevent future problems. At Integrity Roofers, our expert ice damming service crews diagnose and resolve the main cause of your problem to prevent it from recurring. We conduct a detailed analysis of your roofing system and make repairs and improvements. These may include enhancing attic insulation and ventilation, and sealing any air leaks to help protect your home from future ice dams and expensive damage. If required, we can also provide you with professional snow removal services and keep your roof free from leaks this winter. Avoid the expensive damage caused by ice damming. Call Integrity Roofers today at 416-736-7373.